Peugeot’s family car contender followed on from the highly regarded 406 in 2004 and was offered until it was replaced in 2010 by the 508. Peugeot’s family car contender followed on from the highly regarded 406 in 2004 and was offered until it was replaced in 2010 by the 508. Typical of Peugeot at the time was the 407’s adventurous styling, with its not entirely successful lower front grille giving it a gaping mouth look. Comfort, refinement and equipment levels all appeal though, the 407 selling well in Europe but losing out in Ireland to Japanese rivals like Toyota’s Avensis. Unlike so many family cars in this class Peugeot didn’t offer the 407 as a hatchback, despite the looks of the saloon suggesting otherwise. Those wanting a bigger boot could go for the SW-badged estate, though it struggled to match the ultimate load-lugging capacity of many of its rivals. A coupé version was also introduced in 2006, though you’ll be hard pushed to find one anywhere outside 200 kilometres of Paris. Mildly facelifted in 2008, the petrol and diesel engine line-up was also rationalised - with the result that diesel ruled the roost. In total Peugeot offered five diesel engines in the 407’s lifecycle, with 1.6-, 2.0- and 2.2-litre four-cylinders and two V6s of 2.7- and 3.0-litre capacities. Badged HDi, it’s the smaller four-cylinder diesels that sold in the biggest numbers, with the 1.6-litre being particularly popular in Ireland. Trim levels varied throughout the six-year model run, including S, SE, ST, SR, Ultra, Solaire, Sport and Executive. Even entry-level cars were generously equipped thanks to the competitiveness of the marketplace the 407 occupied, so all came with air conditioning and alloy wheels. The 407 might not be the prettiest saloon out there, but it’s an enjoyable drive. The 1.6-litre HDi version was rightly a big seller, giving good economy for this big family car. It’s not particularly fast, but the payoff is worth it at the pumps. There’s plenty of choice on offer with this engine, and the Ultra trim is the specification that’s most readily available. It features everything you could possibly want too, so aim for the lowest mileage example you can find within your budget. 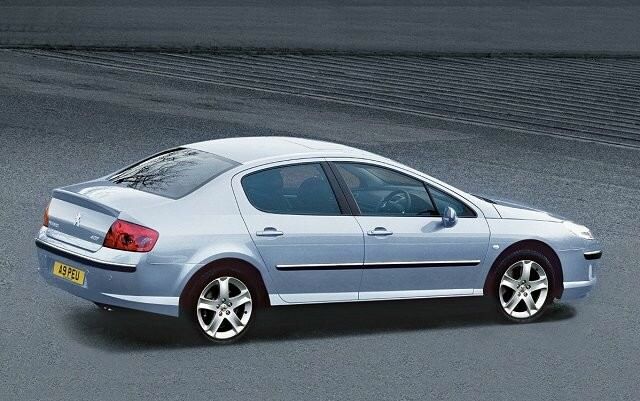 Peugeot’s 407 might be a bit awkward looking, but get beyond that and there’s a fine family car underneath. The diesels give decent economy, the 407’s finely judged suspension delivering good comfort and sharp handling. Plentiful equipment and sensible running costs also appeal, though it’s unlikely to be as reliable as Toyota’s Avensis.